I wanted a nice cool dress to wear to a Christmas party/BBQ next month and I settled on Ottobre 02/2013-14 - the Jewelry dress. 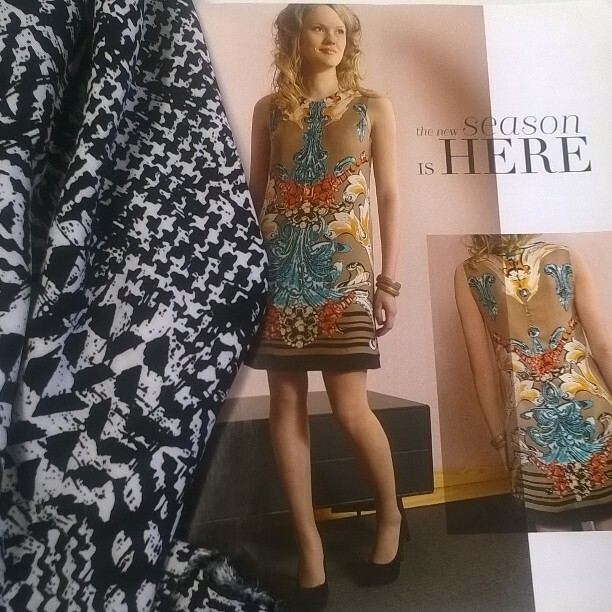 In the magazine they have used a gorgeous large pattern repeat type print. I would love to find something like this to make the dress, but decided in the meantime I should use the fabric I have. I have chosen a black/white viscose twill which was bought at Tessuti awhile back. However this is such a nice fabric I thought I should muslin the dress first. I decided to buy some fabric to make a trial dress as I know Ottobre fit me well enough to get a wearable dress. (Seems so much more productive than making a true muslin). So off to Spotties and luckily they still seem to have some nice rayons left. 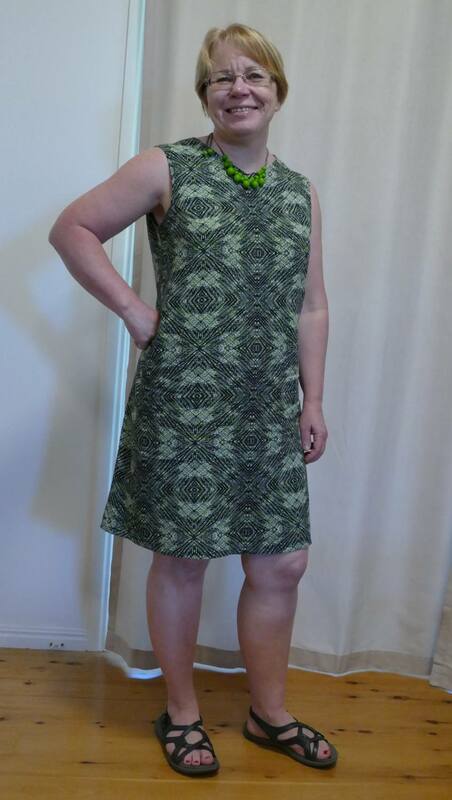 I made the dress true to the pattern but subbed in a facing for a lining. This dress is going to be a casual week-end dress for hot days so a lining was not needed. I am pretty happy with the fit from the pattern, but plan to make a few adjustments to the next one. narrow the shoulder width a little so it looks more like the dress modeled in the magazine. I think my shoulders are a size smaller than the size I used. adjust the back for swayback. It was hard to photograph in this fabric, but I have a little pool of fabric at my middle back. The dress looks longer on me as I am shorter than Ottobre woman. I love the idea of having it shorter, but the legs are not really up to it anymore, so I will probably leave the length as is. As the next one will be more of a party dress I am toying with the idea of making it maybe an inch shorter. I shall see how I feel once it is made. I love the darts on this dress. The bust darts originate at the armhole and so you have a shorter dart and it does not interrupt the pattern so much. There are also back neckline darts which make the neckline lie smooth against the body. You see this in vintage patterns but not so often in modern patterns, but it makes so much sense to curve the dress to your back/shoulder curves. I have marked my changes on my pattern so I am ready to cut my second one soon. I have been wondering how this dress would be if cut on the bias? Ciao kittens... hopefully another Jewelry dress next. Lovely dress Sue, nicely drafted and I agree about the darts, they give a very soft, fitted and flattering shape to the dress. Had to smile, I have the same Spotties rayon fabric, used for the same purpose, to pattern test the StyleArc Candice skirt... just the hem to finish. I had to go and check out that pattern - the fabric will be great for it. I look forward to seeing it! Good idea to test it with a nice rayon. I love rayon .. it's the perfect summer fabric. I agree with you about the shoulder darts.. I always need to narrow the back and shoulder darts help so much. I look forward to the next iteration. I'm loving my ottobre patterns lately. This turned out lovely Sue! I remembered that dress in Ottobre and how I loved the fabric they used. I like your choices of fabric...a great choice for this style of dress! Looks a good fit. Spotlight does have some nice fabrics at the moment. I succumbed at bought some pretty rayon as well. Also great post on pattern review. You brought up a great point which brought results. Thanks Janine. I am so glad others thought the same as me. Nice easy pattern! Would we wonderful in a large unusual print. Looks like you will have at least 2 great summer frocks! Great wearable muslin! Can't wait to see the next one - would be so pretty with black hose and that 1" shorter to boot! The fabric is beautiful. It looks like it hangs off you nicely and is a very comfortable fit. A bias version would cling more and hang down lower at the armholes. Thanks Katherine - I think I will stick with it cut this way then. Great dress pattern, Sue! Your fit for the party dress is going to be spot on! I do love both those darts also. You have a very nice dress there Sue. I really should seek out Ottobre, they seem to have some great patterns. I love this dress on you, Sue. I use a similar bias dress with short armhole darts, an older Sandra Betzina Vogue pattern but it needs more width on the sides because of the bias. A lovely cool dress and I am not renewing Burda this year, maybe it is time to look at Ottobre.